Navigate with GPS by Taking a Picture! I used a Samsung Galaxy S5. This should work with any type of Android device as long as you have Google Maps version 9.21 or higher. It does not seem to work on an iPhone … yet. Before taking the picture, be sure you have the Location Tags (aka Geotags) turned ON in your camera’s settings. I leave mine on all the time. Now, when you take a picture, view it using Google Photos and tap the i (for Information) you should see a map with a marker. Tap the map marker and it will open Google Maps, then tap the Blue car button and it will navigate to the place where the photo was taken. 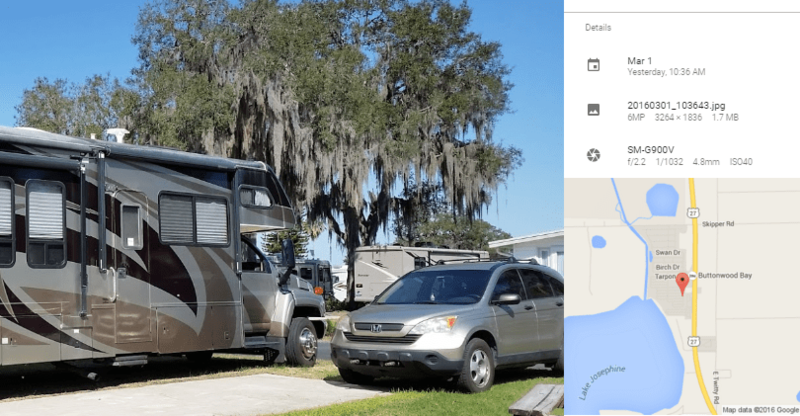 If you are an RVer – this is SO useful! For a long time now, we’ve been teaching people about the ability to save a location with a star in Google Maps, then you can navigate back to the star at any time. I still use this technique, but my Google Maps is getting to be covered with stars! This method of using a picture and navigating to it is great for situations like yesterday. We were staying at a large RV park for only one night, we really didn’t have a feel for the directions within the park at all. So, I took a picture of our motorhome on our site. Then, after going out to dinner, I opened the picture (using Google Photos) tapped the i, then tapped the map and we were getting directions back to our exact site. It would be really useful if you’re trying to return to a boondocking site in the middle of nowhere! Published by MrsGeek, in Blog. Tagged with #WDTBD, Android, Apps for Travelers, Droid, Geeks on Tour, Google Maps, Google Navigation, Google Photos, iPad, iPhone, Navigation, Photo Navigation, Smartphones, Tutorial Video, Weekly Show, What Does This Button Do?.